Gold futures moved lower Tuesday, posting their seventh loss in eight sessions as the U.S. dollar advanced. Gold for December delivery shed $4.50, or 0.4%, to settle at $1,255.90 an ounce on the Comex division of the New York Mercantile Exchange. "The key ‘outside markets’ were in a bearish daily posture for the precious metals, as the U.S. dollar index was solidly higher and crude oil prices were lower," Jim Wyckoff, a senior analyst at Kitco Metals Inc., said in a report. Gold futures ranged from a low of $1,254.30 to a high of $1,264. On Monday, they climbed 0.7%. Lower for the first time in three sessions, silver for December delivery lost 15 cents, or 0.9%, to settle at $17.509 an ounce. Silver futures traded between $17.46 and $17.86. They advanced 1.6% in the previous session. January platinum declined $15.60, or 1.6%, to $949.80 an ounce, ranging from $947.80 to $974. Palladium for December delivery sank $20.40, or 3.1%, to $648.15 an ounce, trading between $647.40 and $672.50. 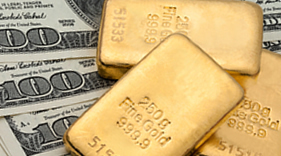 Gold declined $6.05, or 0.5%, to $1,253.45 an ounce. Silver shed 30 cents, or 1.7%, to $17.48 an ounce. U.S. Mint bullion products registered their first gains this week with advances of 6,500 ounces in gold coins and 547,500 ounces in silver coins.